The HoloBuilder Enterprise Dashboard allows you to replicate your company structure using user roles and job permissions to determine access within HoloBuilder. In the HoloBuilder Enterprise Account, there are several different roles for different users where each of them has their own permissions and abilities. It is possible for a user to have only one user role but multiple job permissions depending on how they are positioned within your organization. Essentially, roles can be separated into two types of users: Company Roles (enterprise users) and Job Permissions or Project Roles (individual users). Company Roles are used across the app and provide a general access to the company dashboard, while Project Roles are unique to a job or project. The image below depicts a visual representation of the permission settings hierarchy within HoloBuilder. Depending on the role of a user, he/she has different permissions regarding project access, user management, area management, and billing as listed below. Roles with Enterprise Account Level can view and access the company dashboard and company projects according to the defined permission sets. Only users with a company role can view the enterprise dashboard and make changes on company level. A user with a company role cannot be added to another company as well. Company roles are assigned primarily by the Enterprise Admins in the Enterprise Dashboard. Additionally, any company role can name users with a lower role than their own. The Enterprise Admin is the account owner and has control of the entire Enterprise Account. There can be multiple Enterprise Admins for the whole Company. A user with an Enterprise Admin role can be added to another company. Has view and edit permissions for all projects in the company. Can access and edit the Project Properties for all projects in the company. Can create new and reassign existing projects. Can remove projects from the company. Can archive and download any projects. Has view and edit permissions for all users and user roles in the enterprise dashboard. Can assign any user roles to invited users. Only user to add new Group Managers to the company. Only user to delete users from the company. Has view and edit permissions for all Group Managers. Can assign limited amounts of the total available area to Group Managers. Can give Group Managers unlimited area use. Cannot have a personal HoloBuilder subscription outside the company subscription. Can upgrade/downgrade the total amount of available area for the company. Can cancel the company subscription. The Enterprise Viewer has full access to the whole enterprise dashboard, contained projects and users. However, the Enterprise Viewer has only view permissions and no editing permissions. A user with an Enterprise Viewer role cannot be added to another company as well. Has view permissions for all projects in the company.Has no edit permissions whatsoever. Can view all users and user information, as well as related projects, in the enterprise dashboard. The Group Manager (Regional Control) oversees multiple Project Managers and projects. When no Project Manager is available, Group Managers also share the role of a Project Manager. Group Managers can only be added by the EA. A Group Manager can have a limited or unlimited amount of area assigned to him by the EA. A user with a Group Manager role cannot be added to another company as well. Has view and edit permissions for all projects related to her/him. Can access and edit the Project Properties for all projects related to her/him. Can only remove projects related to him. Can archive and download projects related to her/him. Can view all users and user roles in the User Directory of the enterprise dashboard. Has only edit permissions for users and user roles on project level – PA, PE, and PV. Cannot invite new users to the company. Cannot assign any company user roles to invited users. Can add/remove PA, PE, and PV to a project related to her/him. Does not have any area of her/his own but can use the area of the assigned Group Manager freely to create new projects. Cannot view or access the Managers Overview of the enterprise dashboard. Users with roles on the project level (Job Permissions) generally do not have access to the company dashboard. They are related to individual projects and have no company-wide access. They cannot create new company projects and are only invited collaborators on company projects. 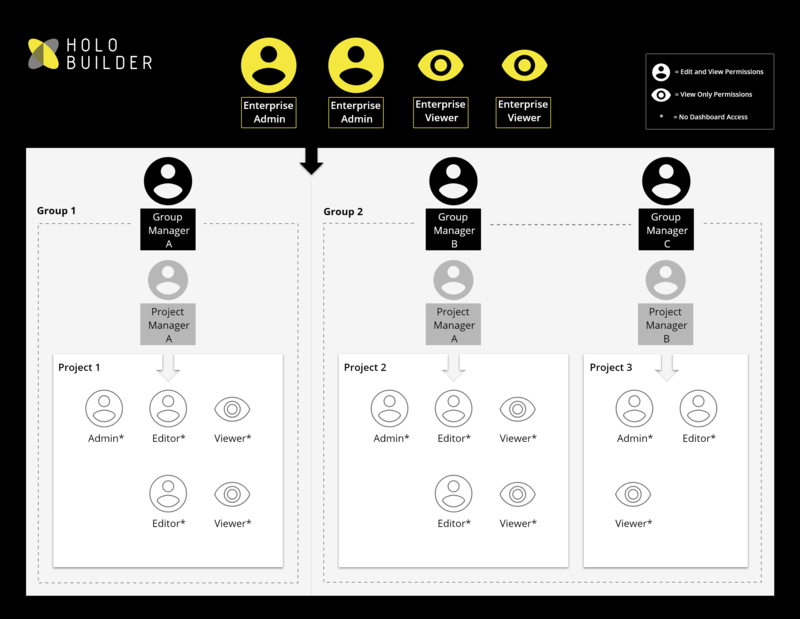 In contrast to users with roles on a company level, they can keep an individual HoloBuilder subscription additionally to their role in a company project. The roles on the project level are more autonomous and can also easily be used for external or temporary users, such as owners and stakeholders, for individual projects. The Project Admin has similar permissions as the Project Manager regarding the management of individual projects. They both have editing and user management rights for individual projects on project level. In contrast to the Project Manager, the Project Admin does not have access permissions for the enterprise dashboard but can only view and edit individual projects she/he was invited to. Furthermore, the Project Admin can have a personal paid subscription additionally to his permissions in the company project. Has view and edit permissions for individual projects she/he was invited to. Can be given job permissions on project level in other Enterprise Dashboards on HoloBuilder as well. Can access and edit the Project Properties for all projects she/he is invited to. Can share projects she/he is invited to. Cannot delete any projects at all. Cannot archive, unarchive or download any projects at all. Can view all users and user roles on project level for individual projects she/he is invited to. Can add/remove PA, PE, and PV to a project she/he is invited to. Does not have any area of her/his own and can only edit/access company projects she/he was invited to. Can have a personal HoloBuilder subscription outside the company subscription. The Project Viewer has permission to view individual projects that are active (not archived or downloaded). She/he has only access to a company project in the web player she/he was invited to as a viewer. The Project Viewer has no editorial permissions what so ever for the projects she/he is invited to. However, she/he can have a personal subscription to create projects of her/his own unrelated to the company.